'Walk This Way' ( Larry Lauer, R. 2001). Seedling #91-153-3. BB, 27" (69 cm), Midseason to late bloom. 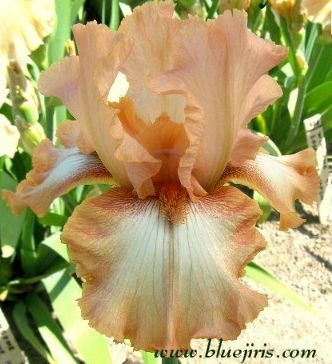 Standards coral pink; style arms marigold orange, falls white ground, peach plicata rim darker at shoulders; beards orange; ruffled; pronounced sweet fragrance. 'Role Model' X 'Oriental Flair'. Lauer 2001.